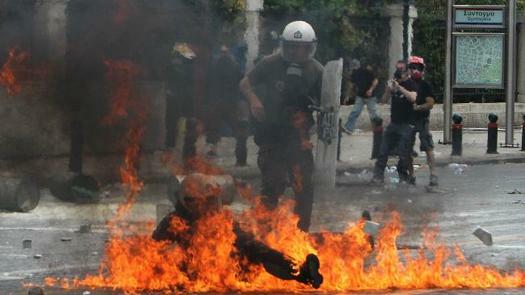 Protestors in Greece have now firebombed several buildings and killed several people. Their banners are the communist hammer and sickle. Their leaders have responded to German charity conditioned upon sensible fiscal reform by denigrating them as Nazis and demanding funds as an entitlement. Any pretense of innocence by Greeks continuing to support the protests has been lost. A rational conversation concerning the extent and shape of reform is necessary, of course - but those now marching in the streets are knowingly countenancing lethal violence as a political tool. While attentive to our own self-interests, the U.S. and EU should allow Greece to starve until she has again regained her sanity and put her house in order. The lunatics running the asylum must be restrained in favor of a completely reformed perspective of economic leadership. This is a European country, for God's sake. How far have they fallen? Serbia is also a European country. It might have been wiser for Germany, et al to have made capital injections into the banks and defined-benefit pension funds which could not readily absorb a Greek bond default and saved the remainder of their powder for assisting Portugal. A critical mass of the Greek public appears to be of the view that if they stamp their feet and shout 'no!' that reality will not intrude. Those being the circumstances, one has to ask if the government can be trusted to implement much of anything. A critical mass of the Greek public appears to be of the view that if they stamp their feet and shout 'no!' that reality will not intrude. That seems to be a common trait among liberals; at least in my experience. They blink uncomprehendingly at obvious facts of existence, then simply deem it no so. Those being the circumstances, one has to ask if the government can be trusted to implement much of anything. Can a thirsty alcoholic be trusted with bottle of whiskey? AD is right. The other EU member countries are trying to prevent another banking crisis much more than they are trying to help out Greece out of altruism, and they should not count on Greece to get it right in the long run. They would be better off taking the economic pain right off and not worrying about whether a Greek government that has consistently lied about its finances will follow through on a very tough series of tax increases and spending cuts. Greek political culture is complicated and the violent protests are actually a smaller problem than endemic corruption and a political leadership class with very little legitimacy. This isn't to dismiss the role of the street protest/general strike/window smashing riot (all three tend to somewhat go together.) The threat of such things tend to make governments think twice about spending cuts and labor force liberalization but my sense is that those kinds of demonstrations are more tolerated than agreed with by the majority. If the protests were Greece's biggest political barrier to economic reform, things would probably turn out okay. Lack of tax enforcement by the government and lack of tax compliance by the public, along with the sense that politics is a game for a corrupt hereditary class (much worse than our Bush/Clinton rotation, the present Prime Minister is the son and grandson of Prime Ministers, his immediate predecessor was the nephew of a PM, the Foreign Minister under the previous government was the daughter and great-granddaughter of Prime Ministers, you can keep playing the game going back decades) tend to make calls for shared sacrifice by politicians a much bigger joke than it would be if it came from the American political class. Which is really saying something. Funny. But, Serbia's been an independent democracy since about 2006? Greece has been one since 1700 BC. IIRC, Greece was a component of the Ottoman Empire, and various formations prior to that, up to about 1830. It had a military government from 1930 to 1941 and again from 1967 to 1974, was occupied by the German Army from 1941-45, and had a pitiless civil war from 1946-49. Per Kenneth Rogoff, it also defaulted on its debt ca. 1965. Justin, Greece has had uninterrupted democratic rule since 1974. From 1967-1974 it was a military dictatorship. Before that it had, in the previous eighty years, experienced two other dictatorships and a period of Nazi occupation. None of this is an excuse for the Greek government's behavior in the last twenty years when it comes to spending and taxing policy. I don't think that pols ran up Greece's debt to GDP ratio because they feared for the republic, but because they feared that some other politician would be elected at the next election. I just don't think that the protests are a good way to understand the rot in Greece's political system. Looking at the machinations and ancestral score-settling within Greece's main opposition party (the "conservative" New Democracy party) is probably a better way to start. The party leader Antonis Samaras just expelled his main internal rival Dora Bakoyiannis. The official reason was because she voted for the government's combination of tax increases and spending cuts. But Samaras had earlier been expelled from the same party by Bakoyiannis's father (over who would take the blame for a foreign policy mess) when her father had been party leader and Prime Minister and Samaras had been Foreign Minister. No principle or sense of the national interest is in sight. J, I'm sure the Serbs I know would claim credit for democracy, liberty, and constitutional govt. Also, Greek democracy was much despised by Hamilton in Federalist #9, with good reason, as it stood in contradistinction to the rule of law. I once met a Bulgarian academic, who, when I mentioned some work I had done on Aristotle, declared that he was a Bulgarian! They're all a bit imperialistic down that way. I think the reasons for protest in Greece are far more complicated than simple demand for hand outs. So what if they sit down and shut up; the IMF loots the country and they get loans they can never pay back by the same banks they now have loans they can never pay back. Its coming here soon. The dollar will fall and we will have the same thing. Brutus, so many Greeks have become dependent on their government for sustenance, without it how will they live? When you tell people they must totally change their lives they are likely to get a bit testy about it. Government dependence is bred in that kind of democracy that Pete and AD are talking about. The modern political history of Greece has led them to this inexorably. You are correct that this is the state that many of our own countrymen are in, government dependence for sustenance, and that puts our nation's financial stability at risk. Republicans are very unpopular among that class and are accused for lacking compassion when they say, "This is unhealthy for man and nation." It manifestly is unhealthy for man and nation; look at Greece and those other nations with overwhelming welfare programs. I do not see how the IMF loots countries, except maybe for donor nations like ours. What are you talking about? Kate, Greece has a domestic product per capita about 63% that of the United States. It is a second-tier affluent country. One trouble is, Greece has been borrowing from abroad at an abnormally high rate to sustain a standard of living that it cannot (their balance of payments deficit on current account is about 14% of GDP). The apparatus of state is a producer of services and (under certain circumstances) a producer of goods. Greece does not have a command economy like Soviet Russia; much of what the state does does not involve production (even production of junk goods and junk services) but redistribution. Redistribution means that incomes are politically determined. This has a negative impact on pareto efficiency and it also means that disputes over compensation are channelled into the political process. They have to come to live within their means (not borrow from abroad) and renegotiate their social compact (retirement at 75, not 57), but the factors of production they have make for a good standard of living compared to most of the world. AD, what is a normally high rate of borrowing from abroad? Do we have that? "Renegotiating their social compact" is just what I meant. That's got to be very painful, not just because of the money for individuals, but also because it requires a change of national character and -- I don't know how else to put it -- of the nation's self-image. Greece has been one sort of nation and now it will have to another, or else.... Or else what happens? What previous nations have had to do this to themselves? Nations go into economic decline, of course. Prosperous Rhodesia to destitute Zimbabwe comes to mind, but, by gum, there was a change in national character wasn't there, of another sort. Basicly what happens is that the IMF gives out loans to the corrupt leadership of a country with both parties knowing the money will never get paid back. Then they simply take over the infastructure or whatever is profitable and have the wealthy nations subasadize all the losses. Then the people have nothing left but to beg for the state to save them and the eugenics projects start. One could call it the Africa system or even the Argentine model. I think fighting on the streets is preferable to servatude to the globalist banks even if those people are misguided socialists. That being the case they probably won't be able to govern themselves in any rational way if they are able to overthrow their government and the banking despotism; but mabye it takes that failure for them to realize the ignorance of their ways. Continuing to band aid things is going to go no where good. It will be interesting to see what happens there in regards to the Euro as it won't be just one country suffering from hyperinflation but the entire continet if they try to band aid things. Talk about a convincing arguemnt that the New world order system is doomed to be a hellish existence for us in the 99.99999 percent. I think our current account deficits run to about 4% of domestic product. The thing is, we had surpluses fairly consistently from 1914 to 1982, and deficits ever since. So, we have been increasingly in hoc to institutional and individual investors abroad who consume less than they produce. A good lot of that debt is held by sovereign wealth funds in the Far East. That's the 'Reagan Legacy', more than anything else, though every Congress and Administration since has exacerbated the problem, bar George Bush pere and his counterparts. It is painful on two dimensions. The first is that recipients of wretched excess in redistribution have their expectations and these expectations have to be lowered, and lowered at a time in their life when their capacity to adjust is diminished. The other is that cutting the consumption of a whole society by 14% is a bloody business, implying mass unemployment from which it takes years to recover. Consumption is derived from domestic product. Now consider occasions where you have seen abrupt year-over-year declines in domestic product of that magnitude. I can think of two examples: Indonesia during the Asian crisis of 1997-98, and the United States during the most harrowing year of the Depression (1931-32). Dreadful, but something from which both the United States and Indonesia had recovered from within a decade.